Faça um passeio turístico particular em Guayaquil e obtenha uma visão privilegiada da cidade mais populosa do Equador. Seu guia local vai compartilhar os meandros da vida da cidade enquanto você explora as ruas movimentadas. Acrescente uma visita opcional ao Parque Histórico de Guayaquil, onde você aprenderá ainda mais sobre a diversidade ecológica, história, cultura e arquitetura do país. Seu guia amigável irá encontrá-lo em seu hotel e conhecer os detalhes mais importantes do dia antes de embarcar em um passeio turístico particular em Guayaquil, com parada opcional no parque histórico. 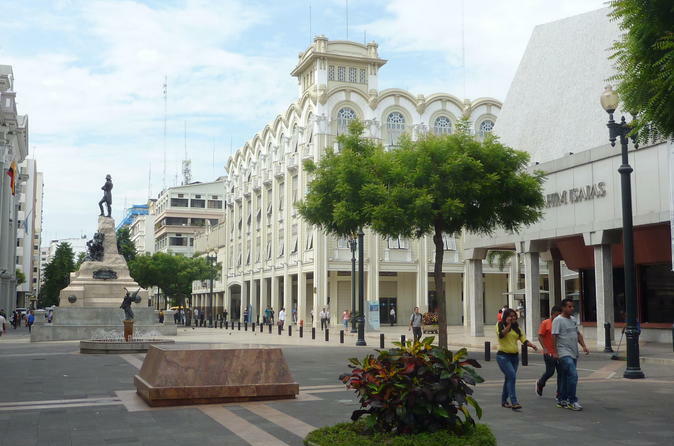 Visite o Bolivar Park e aprenda sobre sua história e importância com seu guia, depois passeie pelas movimentadas ruas e vastas avenidas de Guayaquil. Veja estátuas icônicas como as de São Martinho e Simón Bolívar na bela La Rotonda. Em seguida, confira o bairro mais querido da cidade, com restaurantes saborosos, galerias animadas e lojas típicas que exibem belos artesanatos. Veja porque é tão amado pelos viajantes como pelos habitantes locais. Suba a imponente escadaria para o Cerro Santa Ana, que coloca os viajantes a cerca de 300 metros acima do nível do mar para uma vista verdadeiramente incrível de Guayaqiuil. Finalmente, siga para Malecon 2000, uma passagem panorâmica de 2,5 km que tem vista para o famoso rio Guayas (Rio Guayas). 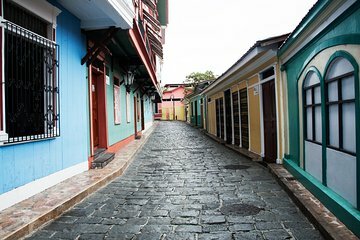 Cercado por lagoas, playgrounds e monumentos, é o lugar perfeito para passear antes de voltar para Guayaquil. For a private tour the guide wasn't very good. My guide Ivan was incredible! The morning was packed with a marvelous tour of the city! Maybell is an awesome guide! We had a wonderful guide and driver. We wanted to change our itinerary a bit and it was no problem. Great tour. Our tour guide, Michael, did his very best to make sure we understood what we were seeing and provided us with a glimpse of the vibrancy of this interesting city. I already did this twice!!!! We enjoyed this excursion. Our guide took us to a new pedestrian bridge on the water front for a good view as well as a view of the port activities which made Guayaquil what it is. She had us taken by the waterfront for an understanding of the city's origins as a trading centre. As we indicated we had to be back at hotel for our afternoon shuttle she adjusted time accordingly to our wished. Also we had already visited part of the intended itinerary so we didn't repeat some things in interest of time. She gave us a good tour of the Malecon start and finish and if we had wanted to we could have got out more and walked more if we wanted to. She took us up the hill steps to the lighthouse. We also had the tour of the historic park which was a good option. I would not recommend this tour without this addition as it explains the ecosystems, city history and is very worthwhile. Our tour guide was Diana. She is excellent !!! Excellent, professional and personal. Our interests were accommodated.